If not, do I just arrive on a tourist visa and then what? Most normal sensible first world countries you can change your visa at their country. Sorry, DD, but it s very rare to be able to change your visa when inside a country as that means you had entered on false pretenses. but if you arrive on a social visit pass (like a tourist here) you can look for work and convert to an employment pass once you get it. thats how it used to work anyway. Getting a visa in Singapore is quite easy, even as a "freelancer"
So what about hotels on Orchard Road near, ahem, Orchard Towers? Hilton etc want at least 250 USD Know of any good deals? I never ever was able to see the person who slides the massage card under the door, may be they send it by "sarbacanes " ?.. Is this hotel still nice and medium priced ? Half of my problem is that I'm not being directly employed by anyone in Singapore. I'm being contracted out by an Australian company to a Singapore based company that will then contract me out to another Singapore based company. The Aussie company has no experience in Singapore. I have no direct contact with either of the Singapore companies until I arrive. I rang the contracting company today and they reckon that they can "fast track" the employment pass. Given that only 2 weeks ago they were taking about an employment visa I seriously doubt that they have any clue. Thanks for those links. I'll have a read. Well I received a call yesterday from the agent in Singapore. Apparently I'm starting in Singapore on 17th September. I still don't have an EP and I hadn't resigned from my current employment. For the first month I will be working in Tampines which is the east side of Singapore and then after that I'll be based in Science Center which is the west side of Singapore. Where would you suggest is a good area to live? I certainly wont be on a CEO megga $$$ package and only need a 1 bedroom apartment. Somewhere with a fairly easy commute would be nice. I was in there a couple of weeks ago, to eat! ok I went to a couple of the bars underneath, looks to still be ok, though showing it's age. Hmmmmmm.......I think Clementi/Dover area is the best. Singapore is a small place. Wherever you are, if it is close to an MRT station you are not far from town. Funnily enough, I dont live too far from town but because there is no mrt station nearby it takes me just as long to get to work as those living way out east or west with good MRT access. Thanks that seems good. District 5 right? How much should I expect to pay for a 2 room apartment? Is there many small apartments around? Most of the web sites that I check don't seem to have any 1 bedroom apartments. prices are changing so fast (upwards) it is hard to keep up. you probably will be looking at between 1.5k to 2.5k a month for modest accomodation (HDB flat or older private apartment) in that area. There are a few property agents with websites. I cant recommend any because i hate the lot of them but do a google for singapore rentals and email a few of them with your requirements. Back to the hotel question. I used to travel to Sing on buisness regularly from Malaysia ( and still do from Phuket occasionally ) Always stay at Hotel 1929 in Chinatown. Really nice ! Company always picks up the bill but it was/is about 75 sing$ a night - may be corporate rate though. It is quite nice, but Hotel 1929 is a lot more expensive than that now. From the hotel's own website a single room is S$140 and a double room is S$160. Even the much lower class Keong Saik Hotel is around $90 a night these days. I like the Asia Hotel, or, Cairnhill. Both within walking distance of Orchard Road. This will take you over the Causeway. You will alight before immigration, fill out the documentation and walk on through - no charge. You can take a 5-minute walk to the shopping malls, it is hot and you'll be waylaid by dozens of guys offering taxi services. Bargain! There's a pattern to the madness: Singaporean-operated buses (SBS, SMRT, SJE) can only stop at one destination in Malaysia, while the Malaysian-operated Causeway Link buses can only stop at one destination in Singapore. Terminals aside, all buses make two stops at Singapore immigration and at Malaysian immigration, which gives you the opportunity to hop on (esp. on those line buses where you can pay with an ez-link card). At both immigration points, you must disembark with all your luggage and pass through passport control and customs, then board the next bus by showing your ticket. On the Malaysian side, the bus stop is to your left as you exit the immigration post. Figure on one hour for the whole rigmarole from end to end, more during rush hour. Note: Embarking of the express bus (and others) towards Singapore is done after you pass the customs. As you can pass from JB to the bus without passing customs first (by jaywalking across the street from the Lucky Foodcourt), this leaves you without an exit stamp. This could give you quite some trouble later if you try to re-enter Malaysia (as the Singapore customs pointed out). one thing though, if you come back to singapore again via the causeway there is a very good chance your bag will be searched/put through an x-ray machine. don't bring any pirated dvds or cigarettes (more than one pack) with you or your day will be ruined. another interesting development is that they have started giving 30 day social visit passes to Singapre at land and sea entry points to Singapore (at both Malaysia entry points and also from those ferries arriving from indo etc at Harbourfront and Tanah Merah). Previously you could only get 30 days if you arrive by air. So that's good news for all the hookers and anyone else who wants to stay longer in Spore. Slimboy, can you get some snaps of the warnings signs? My fav was one at SingTel's bldg on the other side of the MRT from Orchid Road. 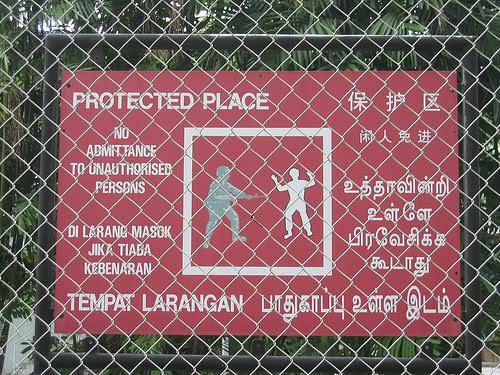 The one with the cop holding a rifle shooting a guy who trespassed.